← Should Happiness Come Last? I hope you enjoy reading this as much as I enjoyed writing it. A little inspiration can go a long way. This story was hatched on a cool Georgia night around a brand new fire pit. My daughter recently graduated from high school, and we celebrated in her honor. 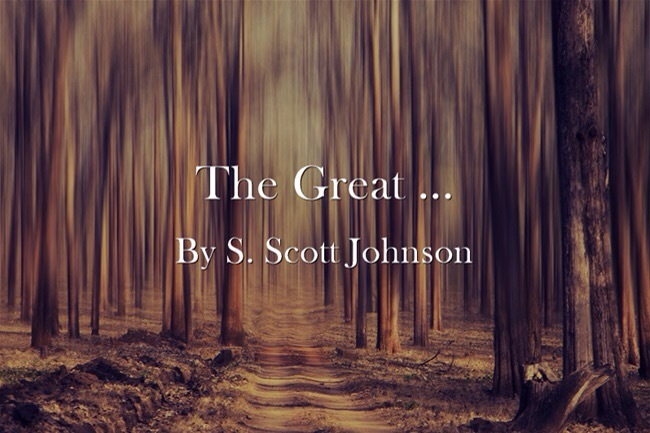 So take a minute and check out my short short story, The Great ... Maybe you can identify with this close-to-the-truth tale. The night ran cold behind the cricket songs, as the shadows undulated with the tiki torch’s flame. My friends and family chatted nonstop around the newly constructed fire pit, congratulating and reminiscing. A milestone was reached that day, my daughter graduated with honors and the memories were laid thick like the stones of a great castle. I smiled at her across the dying fire as a growing pride began to swell in my throat, pushing out a stray tear or two. I thought back on Stella’s life and what it meant to me, what it meant to all of us. She had beat this thing that touched her heart and tried to destroy her. And now she would dedicate her life to study medicine, figuring out ways to save others from pain and setback. To say we are proud is an understatement. Past images began pouring in like a rising tide. I can see me and her dancing at the Father/Daughter Dance. Seemed like yesterday. She was so pretty and only four feet tall then. The little white dress. The mask of gold paint and glitter. Up until this night, I had been leading. Now life and another man were cutting in on our final song. I remembered the day we brought the beagle home, the sweet animal that presently lay sleeping on my lap. Her eyes lit up when she first saw the pup, and a bond instantly formed between the two. She decided to name the dog Chevy after the car her brother was in the process of restoring. It was fun watching these two grow up together over the years. This little hound dog has brought a lot of love and happiness to the Jensen household. As I stroked the dozing animal’s head I felt her come to life, and she was looking intently toward the woods. Her nose began to sniff the air, feeling the molecules that whispered ancient secrets. I dismissed Chevy’s rousing and, instead, shifted to pondering my daughter’s future. Would her health remain strong? Would she have a good marriage and career? Would I live long enough to see her bear kids? Would Stella have a happy life? The questions were piling up now like a flooding, raging river beating against a dam. The marshmallows swelled and blistered above the glowing coals. Others burst into light, the ones that touched the dancing flames. The perfect ones slipped away through smacking lips, savored by smothered tastebuds. Oh, the laughter, smiles, and dreams that swirled around the flagstone patio that cool Georgia night. I noticed, presently, that Chevy was standing in my lap. Muscles twitching, fur bristling. Deep inside her a low, steady growl began to form. The hazel eyes pierced through the darkness and knew something was there. Like a rocket, she sprang from my lap toward the dark woods. I quickly stepped on the leash to stop her. She barked frantically, the kind of bark that made the neck hairs stand and the skin tingle. A scene you might imagine from a Stephen King novel. The partiers all hushed and smartphone flashlights came on. Everyone scanned the woods with their high-tech gear as Chevy lurched and howled like a monster clawing its way toward another monster. I asked my wife to take the dog inside, as we didn’t want to disturb the neighbors. Chevy strained and resisted all the way to the house. It was both comical and yet alarming. As the lights went off, the guessing began. It must have been a deer, one person said. Another suggested a opossum. Another a coyote. Julie, my niece, said it was Bigfoot, and she elbowed me, snickering the whole time. She knew I was a big Sasquatch fan. But I knew it was none of these. I knew exactly who it was. I had caught a glimpse of him only moments earlier. He had slipped out of the deep woods both stealthily and calmly. Even then I could see him leaning against an oak tree, smiling at me. I smiled back. One by one the crowd thinned. It was growing late. Hugs and kisses were exchanged and more well wishes and words of encouragement were flung upon my daughter. Finally, my daughter and her boyfriend went back into the house. I was alone to put the fire out. He stepped toward the fire pit and squatted. His expression had become neutral. But he said not a word. I could sense that even he was unsure what he had to say. He scratched his temple and stared straight into the glowing embers. His powerful hand reached out and rested on the coals. He stirred them with his index finger and they came to life. I think the being in front of me must have struck an earlier deal with God, because I knew he could never lay his mangled finger upon my destiny. Yes, he shook my emotions many a time. He nearly destroyed my confidence on several occasions. There was a time my faith seemed as delicate and fragile as a ceramic doll. But the guy by the fire had his limits. Even he knew that. In my younger years, I barely even knew he was there. It was only in my late teens and early adult years that he began to make his presence known. His visits became more frequent and were especially frightening. It’s hard to describe him, even the great horror writers of our time would be hard pressed to reveal his composition and character. If it had not been for my faith in a benevolent God, the creature across from me might have sent me to the looney bin. But I gradually began to see him in a different light. Over time, he began to lose the terrifying look, and I would like to one day meet his plastic surgeon. Now his appearance is rather plain–neither beautiful or horrific. Perhaps docile is the right word to describe his demeanor, but I still know what he’s capable of doing. I would never turn my back on him. No, this isn’t the Devil, though the two are close friends. The creature before me doesn’t take orders from the Devil, either. He just is. And I suppose he will continue to drift in and out of my life even until my dying days. In many ways, he’s made me stronger. I can see that now. An old enemy that’s become something of an ally. A villain who has defined a reluctant hero. I look at him now with compassion, for I know he has an expiration date also. “So are you going to say something?” I asked one final time. He stood up, yawned and smiled yet again. He started to whistle an old familiar tune, turned and gingerly walked back into the woods. “I’ll see you later,” I said. And he waved his black hand in the air to acknowledge me. Don’t think for a minute that I’m crazy or walk around with an imaginary friend. Surely you know this guy too. You’ve even chatted with him. Trembled in his presence. Sweated bullets for him. Fought against him. Prayed over him. Next time you’re alone by the fire or sit under the stars, look over toward the woods, because he will be there. Dogs love to bark at him as he silently laughs back. His cunning nature inspires the best campfire stories. There are people who build entire careers around this guy. He likes to stand alone in the shadows, thinking he’s hidden when he’s not. If I were you, I wouldn’t underestimate this one. Yet don’t cower when he seems so near. Though he’s great, he’s not the greatest. Who is he? He goes by many names in this world. He is none other than the Great Unknown. This entry was posted in Writing and tagged adventure, creative writing, fiction, short story, story, suspense, tale, writing. Bookmark the permalink.